Forum Uranium Corp. ("Forum") is pleased to announce that three of the eight drill holes completed last April on Forum's 100% owned Highrock Property encountered elevated levels of uranium, boron, vanadium and base metals along the 10km long graphitic conductor on the property. These geochemical pathfinders may be indicative of uranium mineralization in the vicinity. Drilling has further identified a 1.5km long section in the north area and a 1km long section in the central area that require follow-up gravity work and drilling. A 3km long section of the conductor in the south part of the project has not yet been drill tested by Forum. Targets on the Highrock property are interpreted to be the same unit that hosts the Key Lake uranium mine located 15 km to the north (Figure 1). 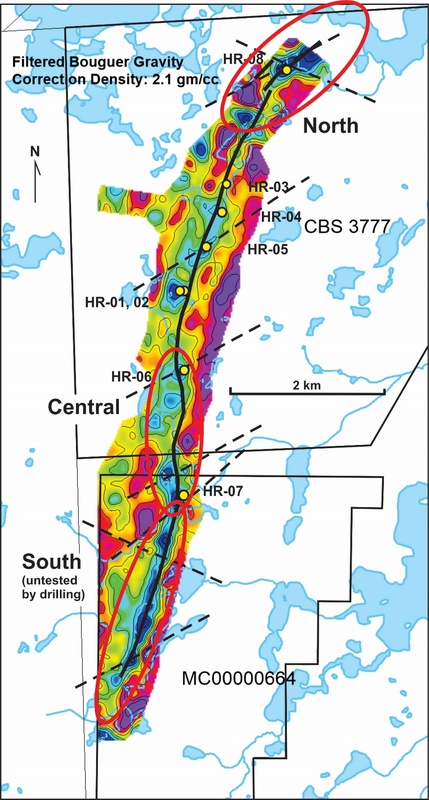 Drilling targeted a series of gravity lows (an indication of alteration associated with uranium mineralization) and several major cross-cutting structures along a strong graphitic conductor (see Figure 2). Holes HR-06 and 07 targeted gravity lows at the interpreted intersection of a cross-cutting northeast orientated structure within the north-south graphitic conductor. Both holes intersected zones of strong tectonization and alteration, with holes HR-06 and 07 being exceptionally well developed with sections of missing core, fault gouges, chloritization and bleaching. HR-07 returned 3 weakly elevated zones of radioactivity (see April 7, 2016 news release), and holes HR-06 and HR-07 returned elevated boron, 4 to 8 times background for the region (up to 161ppm), along with vanadium (up to 234ppm) and copper (up to 252ppm). Given the positive results in the Central area, a 3 km long section of the conductor untested by Forum drilling to the south of hole HR-07 requires follow-up work. Hole HR-08 tested a very strong gravity low at the north end of the property where the main conductor trends to the northeast. Weak alteration along a strong conductor was encountered in this hole, plus elevated uranium (8ppm), vanadium (442ppm), copper (421ppm), nickel (125ppm), lead (46ppm) and boron (116ppm). Future drilling will test this large gravity low further to the northeast along an untested part of the conductor exceeding one kilometre in length, and located near Forum's property boundary with the neighboring Key Lake mine. (Figure 2). Figure 1: Location of Forum's Key Lake Road projects with the Highrock claims on the northeast side. The background is from an airborne magnetic survey (reds are highs, blues are lows) and the red lines are EM conductors, typically caused by graphite. Figure 2: Drill Hole Locations on Ground Gravity Map of the Highrock Project. Gravity lows (dark blue) in combination with long linear electromagnetic trends (black lines) were targeted for drilling. Drill holes are yellow dots, dashed lines are cross-cutting structures. Red ellipses are areas that require further work. Table 1: Selected Geochemistry from Drill Core. 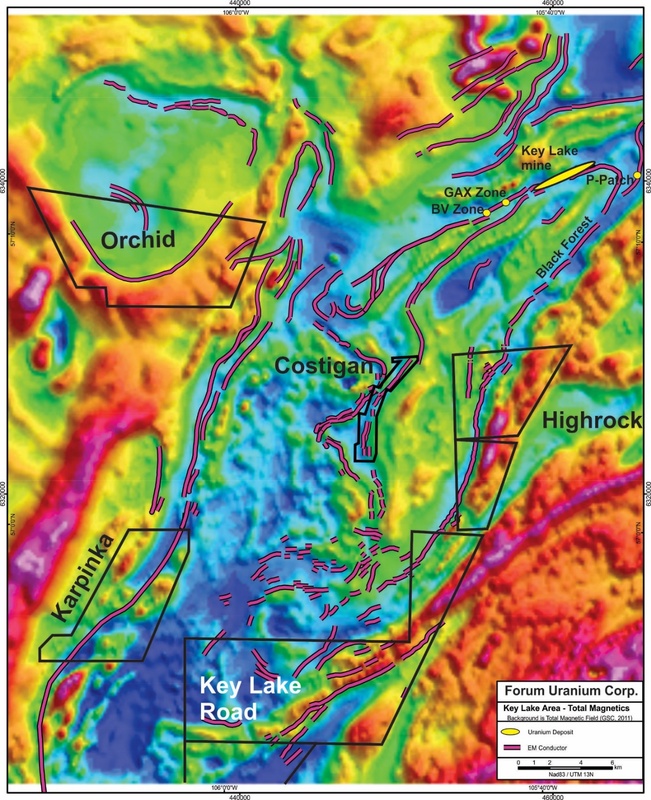 The Highrock claims lie just outside the southern edge of the Athabasca Basin which has the potential to host shallow depth, high grade, basement deposits. Existing infrastructure in the Highrock area is excellent, and includes a nearby all-weather road and powerline to the Key Lake mill site. Ken Wheatley, P.Geo. , Forum's Vice-President, Exploration is the Qualified Person that has reviewed and approved the contents of this news release.